It’s been a while since my last post. Let’s just say the holidays were incredibly hectic! Stradi’s Violin, by Blenda Bligh, which I will be reviewing within the next few days, and Violin Playing: A Physiological Approach, by Isaak A. Vigdorchik (I know, not fiction, but I found it in Goodwill over the summer and couldn’t resist!). This book seems to be out of print and is not available on Amazon, but it’s available via Amazon’s ‘other sellers’. If you’ve read a good violin-related book lately that it’s not in my lists, let me know so I can add it. Let me introduce… my teacher! My violin teacher extraordinaire, Dorina Raileano, finally has a website! For me, Dorina is the embodiment of the perfect pedagogue–she’s firm, demanding, yet warm and encouraging at the same time. 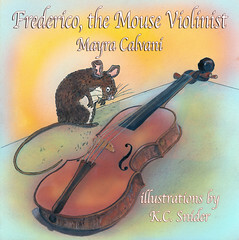 I joined Violinist.com last week and was pleasantly surprised to come across another adult violin student who not only shares my passion for violin-related novels, but who, like myself, is also an author. Her name is Terez Rose and you may find her blog here. I enjoyed very much reading her article, “The Soul of the Violin–Getting It Right in Fiction,” on Double Stop Magazine and I would like to share it with you. Terez Rose’s stories and essays have appeared in Crab Orchard Review, Literary Mama, Espresso Fiction, Unbound Press, the Philadelphia Inquirer and the Milwaukee Journal-Sentinel. She’s also had stories published on various anthologies and is currently working on a novel. My First Guest, Erica Miner, Coming Up Soon! Erica Miner, former professional violinist later turned author, poet and screenwriter, has agreed to an interview, which I will be posting here soon. Erica’s story is both sad and inspiring. After winning the coveted position of violinist at the Metropolitan Opera Company in New York City, Erica had a tragic accident which forced her to say goodbye to her violinist career forever. It was then that she turned to writing. But I won’t say anymore, as I don’t want to give too much away before her interview! On another note, today I bought an EMI Classics cd–The Brahms concerto played by Izthak Perlman. I really needed this one for listening in my car. I have the Ida Haendel DVD where she plays this concerto, but I didn’t have the cd. I just LOVE the first movement. I love the combination of passion and forcefulness with pure sweetness. 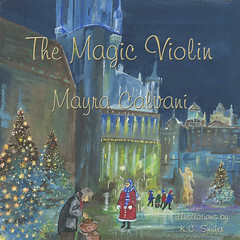 I was pleasantly suprised this morning when I opened The Violin Case Newsletter and discovered that Julie is selling my children’s book, The Magic Violin, in her online shop. 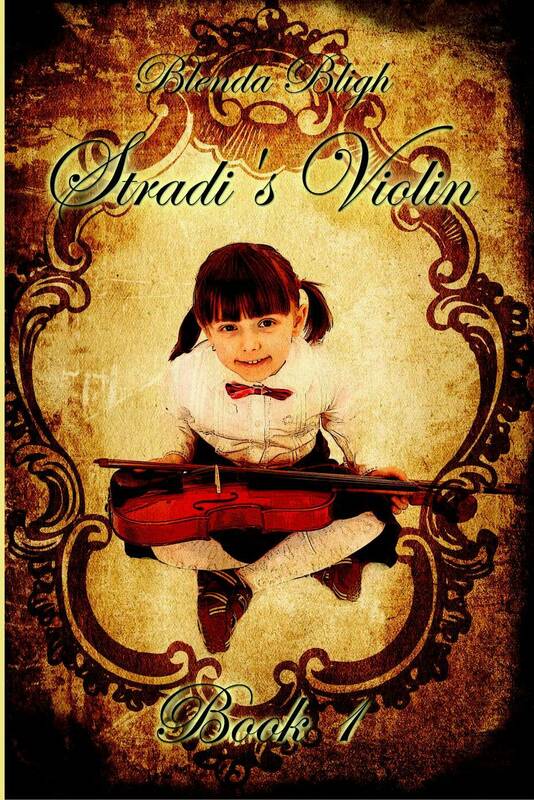 Violin… The word brings such vivid images to my mind. A slender and graceful soloist performing on stage, her eyes closed with delirious ecstasy. The mysterious, dark, gaunt figure of Paganini, his long thin fingers racing up and down the fingerboard with demonic, preternatural speed. Tartini reclining in bed while handing the violin to the devil himself. Sherlock Holmes playing a tune in his small flat on 221b Baker Street. The sound which comes forth from the violin stirs different emotions deep within my soul—sublimity, sweetness, passion, sadness, fear. Sibelius’ concerto is dark and mysterious; Beethoven’s is spiritual and noble; Brahms’ is earthly and passionate; Tchaikovsky’s is grand and dramatic. It’s curious how, unlike other instruments, the violin seems to possess a dark, sinister quality. Surely no other instrument in history has been the ‘victim’ of such lore and legend. The violin is light and darkness. It has two faces, two personas. This is what makes the violin so intriguing. At the same time, it is associated with the feminine. I’m not referring to the shape and sound of the violin, but to the feelings it evokes on their owners. I’ve read that men violinists see the violin as a female companion, while women see it as an extension of themselves. Another thing I’ve come to realize is that most people have intense emotions about the violin—they either love it or hate it. Interesting enough, for someone who hasn’t an affinity for music, the violin can be the most horrific, tortuous instrument to listen to. Always near my computer, my violin beckons me to hold it when I’m stuck in a scene or passage, as if only one embrace, one stroke, are enough to lift the dark cloud from my mind. And always in the background is the violin music, my muse and inspiration. I hope this gift will continue to be bestowed upon me for many years to come.